So a plastic bag for garbage isn't good enough for your car? 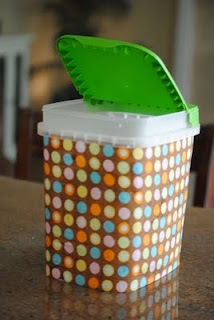 How using about a plastic cereal storage container? Just add a small trash bag, and snap the lid back on! Even cheaper (assuming you use this product) - a recycled Cascade dishwasher detergent container? Just use as is, or use Mod Podge on a pretty fabric or stick on some contact paper! 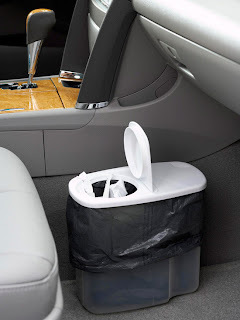 What large size plastic container in your house could you recycle into a car garbage container? Laura Toff posted: Thanks for sharing this awesome idea. If you're brave enough, the cat litter comes in large plastic bins too!!! Tony Chang posted: I reuse my cat litter buckets too, and not just for used litter. Not always the most pleasing colors (Tidy Cats' yellow and red comes to mind) but I suppose you could paint as well as paper? Michelle Rollins posted: Now I totally want some Cascade dish soap containers. Jennifer Heatherly posted: I use the cat litter buckets. One has become the trash can in the laundry room, one is a car wash bucket, etc. Deedee Warner posted: I store cat food (after washing the container, of course) in an empty litter bucket. Penny Jones Roberts posted: I gave one of these to my grandson for storing his Legos... also others for some of his small toys. Amy Madsen Bjerke posted: Good idea! Can't wait to try. Christy Caroline Wong posted: I reused a Cascade bucket as a pen/pencil/marker holder for my 10-year-old daughter. She loves it!